so i am posting it here. 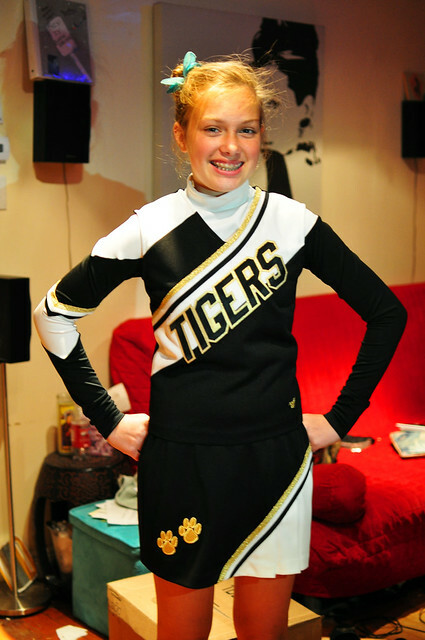 this is zoe in her new cheerleading uniform for her high school, which coincidentally is my old high school! she has been working hard already on learning routines and cheers. they practice all summer getting ready for the first week of school games, at least 3 days a week, and many weeks it will be a full 5 days. she is so excited, the only reason i can't post this on fb is because some of her friends have me friended, and she does not want pics up until she receives her poms and hairbows. she also said her hair looks bad here, but i cannot see anything wrong with an adorable sbun ( recommendation coined this phrase as the name of a side bun). unfortunately i am too busy for a real entry right now, i have a ct scan in 2hr that i need to get ready for. fyi still no answers and at this point i have seen over 20 specialists, had 4 kinds of scans, and talked with three surgeons. it's driving me up the wall. as my pcp said, for most people with unfindable ailments, they come in with pain but no other real symptoms. for me i have an actual physical mass larger than my thumb, but it's in such a weird place where so many organs cross (anterior cul-de-sac and the anterior abdominal wall fyi) that it could really be anything. so, onwards i trudge. hope you are all doing well in lj land. also please excuse the state of my living room in this jpg. between all the drs appts, zoe's confirmation, her graduation, shooting the grad dance (tmrw!!) cleaning out my aunt's mother in law's house over the last few weeks, and completely redoing the girls bedroom, i have not had time to clean hardly at all. in fact, i currently have two dressers sitting in the middle of my living room. here is hoping that with the end of school, i get a little more free time, or at least take a little less on my plate. Awww Zoe is so cute! It doesn't matter if your hair is messy if you have spirit! i hope everything goes well w/the dr. and feel better and i hope life can throw you a nice sloasis sometime soon. zoe looks totally adorbs in this photo. She looks lovely. Sometimes I get bummed about having and older child someday, but seeing pictures like this makes me excited for the future. THAT IS AN EXCELLENT SBUN!! get well soon please so we can hang out when i come to visit! She is adorable and so is your couch. Awww! She looks tick-tick-boom DYNAMITE. So cute! Confession: I always wished I could be a cheerleader. I have no talent or moves for such. Your kids are BEAUTIFUL. Seriously, they get cuter every picture. I am so sorry that you are undergoing such a troubling time of no answers and medical mysteries not to mention constant pain. You are so many things to so many people, and I know that you know to take care of yourself, but I wish I could send you like, an extra day this weekend full of pampering/relaxation/getting all the answers you need with the least invasive and painful and hopefully minor resolution. hey, good luck with everything! thinking of you. and the sbun is adorable! i am catholic in that i was born and raised in the church, but i, personally, became a deist long ago. however we raise the kids up in our church because, its a small town and i cant really NOT do it since my great grandmother named this church and my great grandfather built it. plus tons of the kids do the ccd together (like 20 of the 30 kids in her class) so it becomes another small town semi-social event for the kids. plus eventually if they want to get married in the church (which they might because of our family history with this church) or have their kids baptized or something, its a HUGE pain if you arent already at least baptized and first communioned. i leave the decision of confirmation up to the kids, but so far both zoe and evan have been confirmed, and zoe will probably make her quincy in 2012. also all three of them were altar servers hehe. also also, i am not allowed to share images of her in her uniform on fb until she gets her poms and bows (the special like, super big giant bows that cheerleaders get for their ponytail). and this pic in particular she thinks her hair looks bad because she had that bun in all day and there are lots of flyaways.